The second part of March’s paperbacks stays here in the UK for a while then wanders around all over the place finally arriving at one of my favourite literary destinations. Stella Duffy’s London Lies Beneath begins in August 1912 and follows three friends who have grown up together in the slums of Walworth where they’re expected to live out their lives. When the more adventurous of the three hears of a scouting trip he’s determined to go, taking the other two with him with tragic results. The blurb describes it as ‘a song of south London, of working class families with hidden histories, of a bright and complex world long neglected’. I’ve enjoyed Duffy’s previous London novels – she has a knack for catching the atmosphere of the place, and what a great jacket. London – or at least the City – is the old stomping ground of sixty-year-old Matthew Oxenhay who is driving along the A303 towards Barnet, leaving Somerset behind him in Jim Powell’s Trading Futures. Whether he continues in that direction depends on his wife not answering her phone. If she does answer it, he’ll tell her he’s leaving her, turn around and head back to Anna in Somerset. Matthew’s story unfolds through his own waspish, darkly funny inner monologue. He’s a ‘60s rebel for whom the very idea of a career as a futures trader would have been despicable all those years ago. Sharply observed and grimly funny, in the end Matthew’s journey is a sobering one. Marriage and infidelity also run through Anna Raverat’s Lover. Kate’s marriage begins to unravel when she discovers her husband’s dalliance with another woman. Work offers no comfort as her boss becomes increasingly demanding. Amidst this turmoil, Kate’s priority is to protect her daughters but her life is in tatters. ‘Told with warmth and lightness, even as it also mines real depths of sorrow, Lover is a novel about the hand that life can deal you, and how to play it with grace. Beautifully observed, full of wisdom, poetry and humour, it asks what it means to be true in all things, and in so doing, how to live’ say the publishers, which makes it sound like a nice piece of intelligent, absorbing fiction. Complex family dynamics are a theme of Neil Hegarty’s adroit Inch Levels, set in Derry against the background of the Troubles, about a young man with only a few weeks to live, wrestling with a dilemma and the tortured family history that has led him to it. As Patrick’s recollections unfold they reveal a family whose emotions have been smothered: a mother closed off, unable to express affection; a father doing the best he can but unable to compensate and two children, confused and resentful but knowing that each is all the other has. It’s an engaging novel which shows rather than tells, richly repaying close attention. Finding his family is on the mind of an American student with debts to settle in Miroslav Pensov’s Stork Mountain. He heads for the village of Klisura, deep in the Strandja Mountains on the Bulgarian side of the border with Turkey within spitting distance of Greece, hoping to sell his family’s land and track down his incommunicado grandfather. Beautifully expressed and often very funny, Stork Mountain weaves folklore, dreams and history through its long and winding narrative, often turning back on itself. It’s not an easy read, occasionally bewildering with its many stories, myths and legends overlapping with history, but it’s worth the effort. Klisura once found itself part of the Communist state, the eventual result of the turbulent political upheavals which twenty-two-year-old Gerty Freely finds herself caught up in. Charlotte Hobson’s The Vanishing Futurist follows Gerty to Moscow where she takes up a position as a governess. Three years after her arrival, revolution transforms the city throwing the bourgeois into panicky bag-packing but Gerty decides to stay, becoming involved in a communal living experiment led by a charismatic inventor. His sudden disappearance leaves Gerty alone and vulnerable. Straining for a link to Pamela Erens’ Eleven Hours but I think I it’s beyond me. Set in New York, the novel reveals the lives of two women – one in labour, the other her Haitian midwife. It’s the ‘taut sensitive prose’ of the publisher’s blurb that attracts me to this one together with the interweaving of the stories of two women from very different backgrounds. The ‘sometimes harrowing’ description is a little off-putting but at least we’ve been warned. That’s it for March’s paperbacks which are many and varied, studded with several gems. Should you be interested, a click on a title will take you to my reviews for Trading Futures, His Whole Life, Inch Levels and Stork Mountain, or to a fuller synopsis for the others. If you’d like to catch up with part one, it’s here – March hardbacks are here and here. This entry was posted in Random thoughts, Reviews and tagged Anna Raverat, Charlotte Hobson, Eleven Hours, Elizabeth Hay, His Whole Life, Inch Levels, Jim Powell, London Lies Beneath, Lover, Miroslav Pensov, Neil Hegarty, Pamela Erens, Paperbacks published in March 2017, Stella Duffy, Stork Mountain, The Vanishing Futurist, Trading Futures on 27 February 2017 by Susan Osborne. Pamela Erens’ second novel comes with not one but two glowing quotes from John Irving’s New York Times Book Review piece on the cover. I’m amazed that even the New York Times can persuade an author of Irving’s lofty stature to review a book but clearly they have an impressive literary editor. It’s set in Irving’s own New England stomping ground at a prep school full of kids whose parents are bent on a glowing future for their offspring no matter how troubled and complicated their own lives have become. One such is the narrator, Bruce Bennett-Jones, now a theatre director who is looking back to the events of 1979. Every year the senior boys scrutinise the new girls as they arrive, avid for the possibility of sexual opportunity. Aviva, extraordinarily dressed in a split-skirted purple dress and high heels, catches everyone’s eye. She soon becomes involved with Seung, the son of strict Korean parents. Athletic, popular, the overseer of his dorm, he’s a boy who knows how to bend the rules and how not to get caught. They quickly become a golden couple: attractive, utterly besotted and open enough about it for every student at Auburn Academy to fantasise enviously about what they get up to, not least Bruce who has conceived an obsession for Aviva. But is their relationship all that it’s assumed to be? I wasn’t at all sure I was going to like The Virgins – a couple of scenes of clumsy, over excited adolescent intimacy and I’d begun to worry that the entire novel would follow the same pattern – however Erens gradually draws you in, engaging your sympathy for her characters: very early on we know things are not going to turn out well for Aviva and Seung. Bruce is our guide to Auburn Academy, his unpleasantness established right from the start with his description of the Jewish Aviva as ‘one of those’. The suffocating atmosphere of a boarding school where everything becomes magnified, all perspective lost amidst the burgeoning adolescent sexuality and experimentation is vividly and skilfully evoked. Although we’re prepared for an unhappy ending the final twist when it comes is utterly shocking. Not a comfortable read then, but a thoroughly absorbing one. 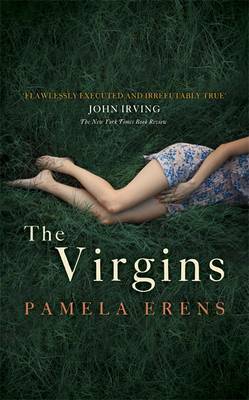 This entry was posted in Reviews and tagged American fiction, John Murray, Pamela Erens, The Virgins on 5 February 2014 by Susan Osborne.